FORT WORTH, Texas (AP) — TCU speedy playmaking receiver Jalen Reagor was sidelined when the Horned Frogs ended spring practice, along with one of their top running backs and two of their quarterback candidates. Several key defenders were there with them. 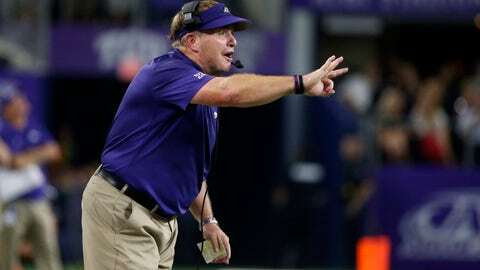 “Everything’s about preparing for August,” coach Gary Patterson said. Reagor, a 1,000-yard receiver who caught a touchdown in seven consecutive games as a sophomore, had what was described as a “minor cleanup” of a nagging ankle issue. The Frogs prefer having him ready to go for the regular season than going through all those spring drills, the same as for running back Darius Anderson after he missed the final two games last season. There is now plenty of time for everybody to heal before the Aug. 31 opener against Arkansas-Pine Bluff that will open Patterson’s 19th season. The Frogs dealt with significant injuries all of last season — starting with standout defensive tackle Ross Blacklock’s season-ending Achilles injury even before the first game. Since-transferred quarterback Shawn Robinson, breakout safety Innis Gaines and Anderson were among many others who got hurt during the season. Rogers, a redshirt freshman, got only a few snaps in the bowl game after dealing with a foot issue that developed when coming back from a knee injury that took away the top recruit’s senior season in high school. Duggan graduated high school early and was able to take part in spring drills.